Today I’m pleased to bring you a guest book review courtesy of my husband, also known as The Audiobook Guy. He spends a LOT of time in the car, and as a result audiobooks are his preferred format for “reading”. This title was a little outside of his wheelhouse, but when the opportunity to review it arose, he jumped at the chance to get back in the game. I hope you enjoy it – and perhaps we can convince him to share his audiobook thoughts with us again soon! Art can live forever… and it can even be brought back to life if cared for by a talented restorer with the right tools. 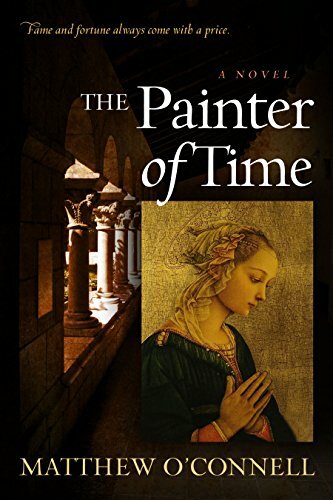 And that’s just what Mackenzie Ferrara wants to do when she joins the team at NYC’s prestigious Cloisters in Matthew O’Connell’s highly acclaimed suspense novel, The Painter of Time, newly available in audiobook. 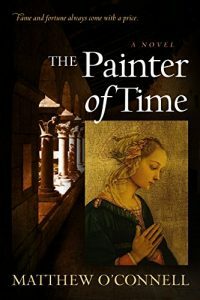 But Mackenzie gets a whole lot more than she bargains for when she meets the Cloisters’ star art restorer, Anthony Bataglia. Immediately drawn to him, they become fast friends, but the closer they get the more questions she has. Because there are some strange coincidences with his work, and things just don’t seem to add up. With the help of her father, a retired detective, she’s determined to get to the bottom of it. 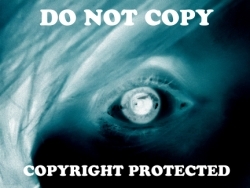 Could Anthony be a fraud whose secret brings down the art world? Or will the truth simply turn Mackenzie’s world upside down? Let me start by saying this was NOT my normal type of book. I tend to listen to action and murder and more traditional thrillers, but something about this one (and the not-so-subtle encouragement from Jill-Elizabeth to review it) led me to give it a go. I really enjoyed it. The audio recording was great, easy to understand, engaging, and enjoyable to listen to. And believe me, I now know more about art restoration and history than I ever imagined I would! The story kept my interest despite it being a topic I knew very little about going in. The foreshadowing was a little blatant and occasionally heavy-handed, but every now and then you’d be thrown a loop that would be completely unexpected, which was cool. There was a lot of detail provided about the characters. Sometimes it seemed like it would (should?) be too much, but eventually s the story progressed all of that detail played into the reveals throughout the course of the book and made the story coherent. I had NO idea the ending would be the ending, which is both a plus and minus here. Things were building and leading in one direction and then all of a sudden the book ended. I found it very confusing. I wasn’t dissatisfied or frustrated, just confused. The obvious conclusion to me is that another book is coming. At least, I hope it is. Otherwise the very open ending seems a little too open… Still, I liked it and enjoyed listening and would definitely recommend it – even if you, like me, don’t know anything about the topic going in!